Recent developments in FIDE have caused the present ACP Board to believe its main purpose for the term has been fulfilled. 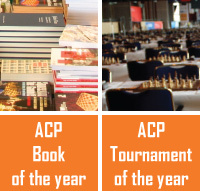 ACP has always aimed to improve the situation of the professional chess players and we can now proudly say that we succeeded. The extent of our success is such that the current government of FIDE has accepted all ACP suggestions and has massively drawn from the current ACP Board for key posts in its own team. While this is a very positive outcome for the chess world, we also feel this situation calls for urgent action. We think that the ACP Board is no longer viable to continue in its current composition and that ACP needs a new lead. The current ACP President has been entrusted with the role of FIDE Director General and is of the opinion that he should immediately quit his position. The same applies to all other Board Members, although some of them might decide to run for a new term. Please be aware that an Elective General Assembly is coming in the second half of December and we would like to ask you to come forward if you would like to run for either ACP President or ACP Board Member. This is a new era for both FIDE and ACP. Let’s make it a great one.